I remember years ago having overwhelming cravings for cakes, biscuits, chocolates and all the things which my diet was telling me I wasn’t allowed to have. Needless to say, I struggled with binging and overeating for 14 years and I know how much time and energy goes into fighting that battle. Hello there gorgeous, me again. 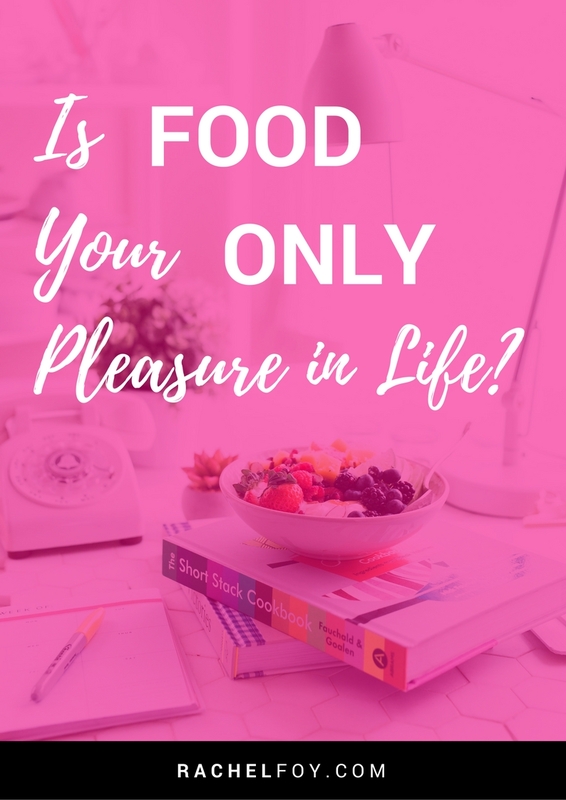 So today’s question I would love to ask you is this…...is food your only pleasure in your life? Let’s have a dive into this because if you are reading this you may feel like you have a food problem at the moment, right? Maybe you feel like you just can’t seem to stop eating, maybe you know that you are an emotional eater and you find yourself binging on food far too often. Perhaps it’s got to that stage where it really bothers you. What I’d like to invite you to do is step away from the food story and start to see this from a completely different angle. Well in the 10+ years I have been working in this field, I can tell you that you don’t have a food problem. The problem you think you have is actually symptomatic, symbolic and incredibly metaphorical. Is it chocolate, crisps, cakes, cheese, biscuits, pasta? What are the foods which you feel that you have a problem with? When it comes to food and eating, food has got to be pleasurable and enjoyable but what I see time and time again, is incredible women (like you!) who come to me as they feel that they just can’t seem to stop eating. Yet when we strip it back and dive into the depth of what is really going on for them, what’s happened is that food has become their only pleasure in their life. They might not feel a deep and meaningful connection within their relationship. They might not even be in their perfect relationship and because of that they aren’t experiencing much happiness, enjoyment and pleasure, so a way in which they are looking to feed that part of their soul which is hungry for pleasure is through……. chocolate, cake, biscuts, crisps, pasta and bread. All the food which they ‘think’ they have a problem with. In the moment of eating them they create this pleasure kick within their mind and temporarily they feel really good, but then unfortunately what tends to happen is they soon feel guilty, ashamed and embarrassed. For some this can even trigger that binge behavior and they carry on eating until they feel disgusted with themselves. So I want to invite you to have a think about this, as if you find yourself doing the same and turning to biscuits and crisps, knowing that you honestly aren’t hungry, yet you are eating it anyway, could it be because food has become one of your only pleasure sources in your life right now? We aren’t judging or criticizing, we are just trying to get to some truths. Finding our freedom with food and allowing ourselves to feed our soul hunger, these non physical hungers, we have to start being truthful with ourselves. I know when I used to struggle with food a little while ago, I had this underlying hungry soul which wasn’t being fed what she was starving for, and actually food (well cake to be specific!) became one of my only pleasure sources. I didn’t enjoy my job, my relationship wasn’t right, I didn’t know what to do with my life. There were so many unanswered questions (creating stress, anxiety and worry), so cake became my only source of pleasure. If you can recognize within yourself that this might be something you are also doing, that is brilliant that you can acknowledge it for you cannot change anything until you know what it is that you are doing. Once you know, you can start doing something about it. If cake or chocolate has become your pleasure source there is absolutely no point in trying to tap into some kind of unshakeable willpower or restrict those foods through dieting, as if you take those pleasure sources away, what’s going to happen?? You are going to lose your mind, rebel and want them 10 times more than what you might do already!!! So dieting, restriction or willpower is not the answer. Remember it is symbolic and representing something else which if you choose, you can start to explore and get to the root cause of. Want some extra help with addressing emotional eating? I’ve created a free training series on ‘How To Stop Emotional Eating’ just for you, which contains 4 videos to show you how to heal your relationship with food and yourself. Missed last week’s post? You can see it here: Do you numb out of life?